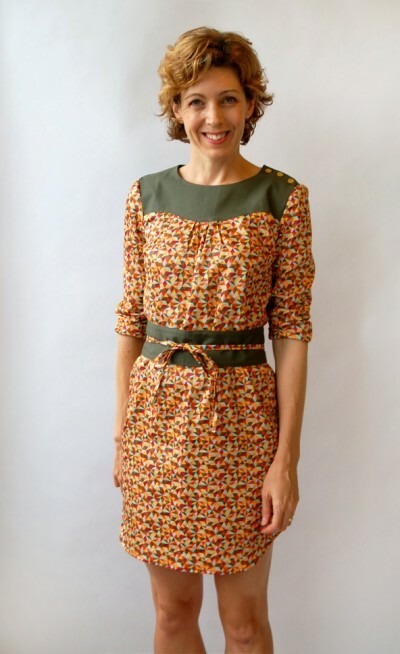 Our second pattern for fall is the Itinerary Dress, Simplicity 2060. This is a sporty style that can also be dressed up. It’s a pull-on dress with buttons at the shoulder and an obi-style belt. Here it is in the mosaic sateen from the fall Lisette fabric collection paired with our coordinating solid-colored sateen at the yoke and sash. This sample is obviously too short on me, since I’m quite a bit taller than average. I’ll be wearing this with jeans and will be sure to lengthen it the next time I make it for myself. 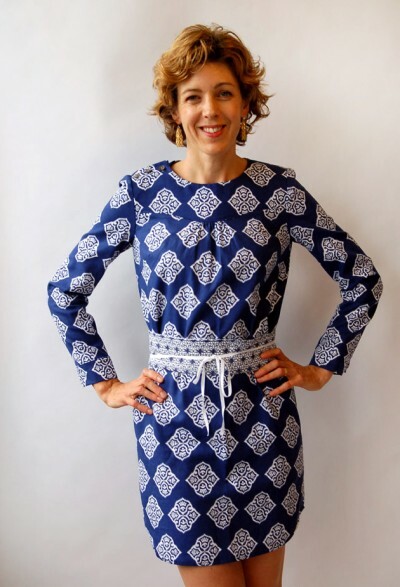 It can also be made in a single fabric rather than with a contrasting yoke, as shown in this version of the dress I made using our lightweight canvas from the first Lisette fabric collection. See how the canvas works so nicely for apparel? It’s a perfect weight for skirts, dresses, and jackets. It has a real apparel drape and hand, unlike canvas fabrics intended to be used for home dec projects. I hope you’ll have fun with these patterns. I really can’t wait to see how you make them. Make sure to share your work in the Flickr group when you’re done. Edit to add: I forgot to mention that this pattern has two sleeve options. You can choose the very simple 3/4-length sleeve (which I like to roll a bit, as in the first photo) or the long sleeve with a very fast and easy cuff (as shown in the second photo). Cheers! I can not wait to make this dress! It’s on my to-do list but I have some very important back to school sewing to do first. This looks a lovely fit across the shoulders and with your legs you can get away with a dress that short! Both versions look very nice. I picked up the pattern and the Continental one yesterday, and look forward to making them.